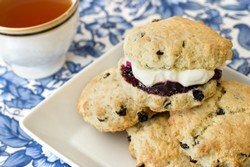 Three traditional Devonshire scones tea party recipes to tease your appetite. Believe me, it is good! Are you getting lonely drinking tea all by yourself? Would you like to have a traditional English tea party in your own home? Devonshire cream tea is tea taken with a combination of scones, clotted cream, and jam. They are offered for sale in tea rooms throughout England (especially the South West) and rest of the Commonwealth, or wherever someone wants to give an impression of English influence. I’ll show you how to make the traditional Devonshire cream tea from scratch: scones, clotted, cream, jam and all! Clotted Cream . Are you on the wrong side of the pond to be able to find this delicacy in stores? Now you can bring the Devonshire treat into your own kitchen. Cream Scones with Dried Fruit. These delicious round scones are perfect for teatime! Granny Jen’s Strawberry Preserves. A secret family recipe for the world’s best strawberry jam! Clotted cream is a traditional British delicacy that is served on scones instead of butter. If you don’t live in the United Kingdom, it is just about impossible to find. However, with just a little bit of effort you can make a close approximation of the real thing. Equipment needed: A double boiler, or two pots that fit inside of each other. Step 1. If you don’t have a double boiler, find two pots that fit inside each other. Fill the larger pot about 3-4 inches full of water. Then, place the smaller pot inside the larger pot so that it floats on the water. Fill the smaller pot with the cream. Step 2. Turn on the heat and bring the water in the bottom of the boiler to a simmer. Step 3. Cook the cream over the simmering water until it has reduced by half. Step 4. The clotted cream is finished cooking when it has a nice golden crust on the top and has turned thick, like butter. Step 5. Take it off the heat, cover it and let it cool. Step 7. Stir the clotted cream before serving it. Step1. Preheat your oven to 425° F and grease a large cookie sheet with butter. Step 3. Cut the butter into ½ inch wide squares, and then add to the dry ingredients. Use a pastry blender or two knives to cut the butter into the dry ingredients until the mixture becomes like coarse crumbs. Step 4. In a smaller bowl, combine the cream, eggs and vanilla and whisk together until thoroughly blended. Step 5. Add the liquid mixture to the dry mixture and stir until a dough forms. Step 6. Stir in dried fruit. Step 7. Coat the surface of a cutting board and your hands with flour. Step 8. Turn the dough out on the cutting board and use your hands to pat it down to an even sheet about ½” thick. Step 9. Use a round cook	i.e. cutter to cut out scones and line them up on the baking sheet. Step 10. Take the scraps, knead them together and repeat the process of cutting out scones until all the dough is used. Step 11. Bake the scones for about 15 minutes. They are ready when they are golden brown on top. Step 12. Transfer to a rack to cool, and enjoy! The classic cream tea menu consists of scones with clotted cream and strawberry jam. This is the best strawberry jam recipe ever, and it’s one of my favorite tea party recipes! My great-grandmother used to make me a jar of these preserves every summer. Every summer, I’d take my prize home with me and try to make it last all year. I tried to make the last jar she ever gave me last forever, but of course it’s long gone, so I had to get the recipe for myself. I can hardly believe it’s so simple! Step 1. Mix all ingredients on low heat until the sugar is melted. Step 2. Turn heat up and bring to a boil. Step 3. Boil rapidly for 20 minutes. Step 4. Take off the heat and allow preserves to cool before putting them in jars. To enjoy an authentic cream tea, split one of the scones in half, and cover it with cream and then jam. Serve with your favorite tea! 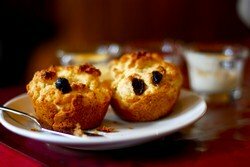 For more tea party recipes, click on the links below to learn more.